Aclara’s Adaptive Consumer Engagement (Aclara ACE®) portal was architected at every layer to be flexible and configurable, allowing for our solutions to adapt to each of our utility partner’s needs. Whether your utility is focused on bill/cost awareness, utility program adoption, water conservation or AMI data presentment, the Aclara ACE portal can be configured with content that is in direct alignment with you utility’s priorities. 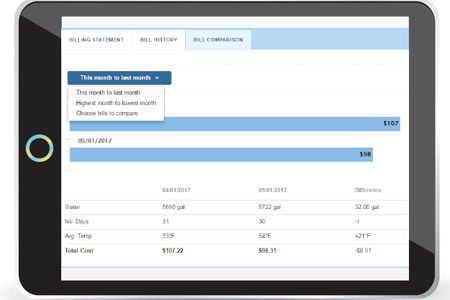 Aclara ACE equips utility customers with personalized content that enables them to better understand their utility bill and changes to their costs (My Bills), transparency into their consumption (My Usage), and tools/information to reduce their overall costs (My Savings). Additionally, our Insights engine generates succinct, direct, and personalized messages for each user that keeps them informed of changes to their costs due to weather or other factors, consumption patterns, and promotion of Ways to Save to help the user control their costs.